I realize we've been hammering the charters pretty hard lately, but the intention has never been a blanket condemnation. There are a lot of good ideas here and even more good people, but, at present, the whole enterprise has at least two fatal flaws: a naive approach to metric-based policy and a childlike faith in the power of markets to overcome conflicts of interest. The result has been exactly what any reasonable person would have expected. Rep. Erik Fresen ['named “legislator of the year” by Florida’s for-profit college lobbying group, the Florida Association of Postsecondary Schools & Colleges'], a font of smiling insincerity, wants the state to turn most of its school construction and renovation funds over to companies that run charter schools. Never mind that traditional schools outnumber charters about 6-to-1. Never mind that from 2009 to 2014, charters got $312 million in capital funds and traditional schools got a pat on the head. Never mind that practically 1 out of every 4 charters eventually closes and that taxpayer money is forever lost. Nope, let's forget all of that for a minute and focus on Fresen, a Republican from Miami. The guy the Miami Herald reports earns $150,000 a year consulting for an architecture firm that specializes in — I can't make this up — building charter schools. The guy whose sister and brother-in-law are executives with one of the state's largest charter operators. Now, who thinks that might be a conflict of interest for a politician in charge of divvying up construction funds between charters and traditional schools? That sounds like at-risk kids. Poor kids. Minority kids. And yet, all these years later, that's not what's happened. For instance, based on the data included in the Florida Department of Education's school grades released Friday, 68 percent of the students in traditional Hillsborough County schools are considered economically disadvantaged. And yet, in the county's three dozen charter schools, only 30 percent of the students are economically at-risk. So maybe Hillsborough is an outlier. An aberration. Except poor kids also are underrepresented at charter schools in Pinellas County. And Pasco. And Hernando. In South Florida, where charters are everywhere, the numbers are truly disturbing. Let's look at the schools where more than 80 percent of the students come from low-income families. Can we agree those are the situations where charters might do the greatest good? Well, in Miami-Dade, more than 51 percent of traditional public schools fall into that category, and only 35 percent of charters. How about the reverse situation? Schools where less than 20 percent of the students come from low-income families? That would be 1 percent of the public schools, and 13 percent of the charters. In other words, the numbers are opposite what they're supposed to be. Charters seem to be catering more to wealthy families and leaving the poor kids behind. And, as a bonus, the state keeps taking money away from those public schools to give to charters. This is not a knock on charters. Many are truly exceptional, and some are succeeding in situations where public schools failed. Instead, this is a plea to parents. To taxpayers. To anyone who cares about public schools. Your Legislature has sold what remains of its dark soul to the growing industry of for-profit education. Lawmakers will talk fancy about being fiscal watchdogs, but it's all a ruse to cater to companies that see students as living, breathing profit margins. Here's more on the story from the Miami Herald. "[A]chievement tests may well be valuable indicators of general school achievement under conditions of normal teaching aimed at general competence. But when test scores become the goal of the teaching process, they both lose their value as indicators of educational status and distort the educational process in undesirable ways. (Similar biases of course surround the use of objective tests in courses or as entrance examinations.)" Donald T. Campbell via Wikipedia. With that in mind, take another look at this and this. ... and I'm not crazy about the central debt metaphor, but Josh Marshall (who has been perhaps the best political analyst on the Trump story) has an essential post on the GOP's loss of control. If you do a search for "Trump" on our blog, you'll see we've been making some similar points for a while now. We've also talked about the implications of a messy primary fight. In another much shorter post, Marshall nails that one as well. As you read this, keep repeating to yourself, "second graders"
Shoulders drop. Children put their faces in their hands. “And do you know why?” The teacher looks around the circle; children avert their eyes. The children nod resignedly. They´ve heard this many times before. The child tilts his head. “What does average mean?” Several children nod; it seems that they, too, have been wondering this, but have been too afraid to ask. The teacher moves the child´s clothespin a rung down on the “choice stick” for speaking out of turn. The children look to the list of “assessment goals” posted on the wall. They raise their hands, one by one. At this school, children are deprived of a comprehensive, developmentally appropriate, and humane education; instead, they are subjected to militaristic discipline, excessive amounts of testing (well beyond that which is already mandated by the state), a criminally deficient amount of playtime (in a nine-hour school day, kindergartners have twenty minutes of recess) [I take it back. That twenty minutes of play is the most maddening part -- MP], and lack of access to social-emotional curricula— all so that the people who run their schools can make a political point. Let me go a bit further. I've seen close up a number of educators, schools and programs that provided kids of color from poor families with "a comprehensive, developmentally appropriate, and humane education" and (once you get past the cooked data) did a better job closing the achievement gap than most of the no-excuses charter schools. One thing that seems to be not well considered is that, in a state of nature, collectivism is also required for survival. Absent science-fiction (or possibly bleeding edge tech) we all require the efforts of other people to come into existence. After all, people all had stages with mothers and with early infant care, in which they could not reasonably be an autonomous individual. The fly in the ointment of Rand’s philosophical “objectivism” is the plain fact that humans have a tendency to cooperate and to look out for each other, as noted by many anthropologists who study hunter-gatherers. These “prosocial tendencies” were problematic for Rand, because such behavior obviously mitigates against “natural” self-interest and therefore should not exist. She resolved this contradiction by claiming that humans are born as tabula rasa, a blank slate, (as many of her time believed) and prosocial tendencies, particularly altruism, are “diseases” imposed on us by society, insidious lies that cause us to betray biological reality. The trouble here is that biological reality involves dependence. At the very basic level, people are from families and not individuals that spring into existence (a point I first heard on Youtube). Is not a natural drive towards cooperation a key element of family? Which doesn't mean that you can't have vicious competition, both within and between families -- consider the War of the Roses, or the fiction series a Song of Ice and Fire. Looking at animal behavior doesn't make things any better. Most mammals have some degree of child care and assistance for offspring. That makes a strong biological argument unlikely. That doesn't mean Rand is irrelevant -- it's an odd perspective and it can highlight some social conventions that need examination. But, as a complete system, it starts out on really shaky ground. As mentioned before, there is reason to believe that at least part of the success Success has had at raising scores on some (though notably, not all) standardized tests can be attributed to selection biases that that effectively filter out many of the kids most in need of help (ESL students, the learning disabled and virtually all of the homeless). A few quick observations on the explicit and implicit here. Starting with the explicit, the administrators are coming out and saying that they were knowingly violating this disabled student's civil rights by denying him legally required services and that they had no intention of spending the money to fix the problem. What's more, they wouldn't provide even accommodations for any infractions despite the fact that some were trivial while others were, by the administrators own admission, the result of the student 's disability. On an implicit level, it is difficult to read this as anything other than a systematic and very effective way of getting rid of kids who put a disproportionate drain on the school's time, money and resources and who are unlikely to do much to improve the school's test scores. In particular, the policy of having (in many cases single) parents have to take off work because their kids were crying or not keeping their eyes forward is exactly what I would do if I were in their place and lacked all sense of common decency. And second, no business model is idiot-proof (though it does take a great deal of incompetence to screw up something this close to a monopoly). Because it has been so poorly conceived (starting with wildly optimistic estimates for advertising revenue) and badly run, Hulu's backers have been backing away for a while now and the company would love to find another pair of deep pockets, and since it has a near monopoly on its corner of the market, it offers potential buyers a unique opportunity to screw over the consumer. Why does Time Warner want to cripple Hulu's big advantage? The company sees "next-day" TV content as something that undermines the value of its pay-TV packages, The Journal reports. Time Warner fears that Hulu's popularity, especially built on the back of current TV seasons, will accelerate cord-cutting, or the ditching of cable subscriptions altogether. At its core, the argument comes down to whether you believe the big bundle, the 500-channel cable package, can be saved. Time Warner clearly does, and it wants to bulk up its own TV Everywhere packages, which are tied to a cable subscription. From this vantage point, it's easy to see why Time Warner sees Hulu as undercutting its business. Time Warner is closely aligned with one of the most hated and antiquated industries in the entire economy, cable TV. That industry is being pressured by new technologies. Of those, perhaps the most threatening are services that allow viewers to see the most popular content cable offers a few days later on the internet for free. If those services were split up over a wide range of providers, Time Warner and the cable companies would probably have to deal with the new landscape by rethinking their business models, improving their product, cutting prices, and doing a wide range of other things we'd like to see. Unfortunately, since so much of this potential competition is concentrated in one horribly managed company, Tim Warner apparently believes it can just buy a stake in the train wreck and force it to stop providing those services to the consumers. "Slam the Exam" = "Game the System"? It is notable and more than a little disheartening that this reporter, like most of his colleagues, seems to see all things that improve achievement scores as equally desirable, even those tactics that only serve to undermine the validity of the test. A recent article in The Information, a tech news site, suggests that during the first three quarters of 2015 Uber lost $1.7bn while booking $1.2bn in revenue. The company has so much money that, in at least some North American locations, it has been offering rides at rates so low that they didn’t even cover the combined cost of fuel and vehicle depreciation. These numbers only have to be vaguely correct for there to be serious concerns about predatory pricing. Because below the cost of fuel and vehicle depreciation is selling at a dead loss. Of course, Uber is a very smart company and they have created a class of independent contractors to try and make a direct link between costs and revenue tricky to do. But, I think we can all agree that when losses exceed revenue then the endgame is not likely to be a new system of rides that are more cost effective. There may be economies of scale, but they are not likely to overcome that kind of problem (not the revenue doesn't exceed losses . . . which is a very long way from profits). Just something to ponder when we make direct comparisons between costs of taxi cabs and Uber car services, like here. These prices aren't going to be this low forever, unless Uber has a clever car plan to reduce costs of acquisition and repair. And that's the part of the plan that I am most interested in. I know I always promise I'm going to come back later and tie things together, but thiss time I really mean it. Take, for example, the famous open letter to Ben Bernanke demanding that he call off quantitative easing. The signatories declared that “The planned asset purchases risk currency debasement and inflation, and we do not think they will achieve the Fed’s objective of promoting employment.” OK, how is that supposed to work? What model of the inflation process do you have in which an expansion of the Fed’s balance sheet translates into inflation without causing an overheating of the labor market first? I’m not saying that there is no possible story along those lines, but spell it out so we can see how plausible it is. What I said in my Mundell-Fleming lecture was that simple models don’t seem to have room for the confidence crises policymakers fear – and that I couldn’t find any plausible alternative models to justify those fears. It wasn’t “The model says you’re wrong”; it was “Show me a model”. The reason I’ve been going on about such things is that since 2008 we’ve repeatedly seen policymakers overrule or ignore the message of basic macro models in favor of instincts that, to the extent they reflect experience at all, reflect experience that comes from very different economic environments. And these instincts have, again and again, proved wrong – while the basic models have done well. The models aren’t sacred, but the discipline of thinking things through in terms of models is really important. For those who haven't been following the education reform debate closely, Duncan's quote tends to come as something of a shock. The idea that the storm was the best thing to happen to any aspect of the city seems too much to consider. Within the movement, though, the Big Easy has long been seen as the perfect test case and its perceived successes have been a source of pride and validation. To a lesser extent (though gaining ground), New Orleans is seen by reform critics as evidence of fundamental flaws in the movement agenda. They point to draconian discipline, student protests and, increasingly, scandals. Danielle Dreilinger writing for The Times-Picayune earlier this month. The former principals of ReNEW SciTech Academy in Uptown New Orleans were accused Friday (Jan. 29) of special education fraud, failing to follow federal special education law and breaking state testing rules. Louisiana Recovery School District officials said the principals, Tim Hearin and Alex Perez, snagged almost $320,000 in public money for the school in the 2014-15 academic year by artificially inflating special education services. Gary Robichaux, the ReNEW group's chief executive during the shenanigans, remains employed by the six-school charter network in an advocacy position at his same $154,000 salary, officials said. That's even though emails released by the state show he knew about some of the manipulations at least as early as January 2015. Recovery Superintendent Patrick Dobard said the issues were very serious; ReNEW is currently in breach of its charter contract, which could result in losing its schools. The Recovery system does not have the authority to recover money SciTech received inappropriately, Dobard said. The special education tricks were big and blatant, intended to fill a $300,000 budget gap that Hearin and Perez knew they were creating at their 730-student school. The Recovery system doles out special education money based on the number of students who need services, their specific diagnoses and the amount of time they need help. SciTech rushed students through special education evaluations, sometimes without parent involvement, increasing the school's budget by $137,800. Staffers also blew up the education plans of 49 students, adding an average of 1,032 minutes of extra help, which totals 2 1/2 days per week; that brought in $180,000. Paradoxically, at the same time the principals juiced the special education funding, they ignored the special education students, telling staff they were "to be a secondary priority to students who were more likely to pass the state assessments," the report says. Some kids, the principals said, "don't count." Seventy-seven children were supposed to have some time in a separate classroom, but there was no evidence SciTech did that for any student last year. Nineteen of 76 children received none of the services in their individual education programs, and about 42 received partial help. Federal law requires that public schools give children the services specified in their plans. Instead, Hearin and Perez spread the money across the school to support increased staffing overall – including "special education" teachers who didn't know they were supposed to teach special education. When one administrator complained, one of the principals insulted them for "conflating law with morality," the report says. The staffer decided three days later not to return to SciTech in the fall. The principals had planned, however. They held back a large number of students going into the fall of 2014 – 15 percent – in the hope of improving test scores. This was one of the violations found in March 2015 at Lagniappe Academies, which the state then shut down. At least one mother didn't even know her child was repeating seventh grade, according to a May 14 email: She "came in today wanting to discuss high school." SciTech leaders also tried to commit another trick later outlined in the Lagniappe report: giving students test accommodations for a disability even if they did not have a disability. Teachers resisted the request; it was not clear in the report whether any gave in. New Orleans charter school Lagniappe Academies illegally deprived special education students of the teaching they needed -- and then faked forms to hide it once the Louisiana Department of Education was on its trail. The school held back almost one third of its students last year, sometimes despite spring report cards saying the child did well. Administrators refused to screen students for special education services even when families had a diagnosis from a doctor. They created a "Do Not Call" list of families whose children they did not want back, and instructed staff to skip them when phoning families with key information about registration and summer session. When state officials were to visit, administrators asked staff to move furniture out of a storage space so it looked like the school had a special education room. And administrators put in for a very high number of disability accommodations requests when testing time came around -- although almost no students received those accommodations during the school year. In a written response, the Lagniappe board asked for more time to consider the findings. It also submitted an affidavit from administrator denying a handful of the allegations. Lagniappe board member Dan Henderson called the report "a big distraction" in a Monday email to NOLA.com | The Times-Picayune. "We are continuing to serve all of our 160 students, and look forward to another round of high-stakes testing, showing again our amazing accomplishments." John Ayers, executive director of Tulane University’s Cowen Institute for Public Education Initiatives, said that’s not surprising, considering RSD’s growth over the past few years. The next step, he said, is for schools with impressive gains to share what worked. “If we have a pocket of excellence that may be Lagniappe — and they may be very proud of what’s happening — how do we get that innovation to spread?” he said. More on the fall-out from the latest Success Academy revelation. Eva Moskowitz and the Success Academies have a long history of putting together what might be categorized as Astroturf events with students, parents and teachers in order to apply political pressure or counter bad publicity. Last Friday's news conference appears to be an example. Abby Jackson writing for Business Insider. "The most heartbreaking part of all of this is the feeling that you [based on the context (see below), referring to the NYT -- MP] don't believe that black and brown kids can be successful," she said. While Moskowitz and her staff and advisers have been fairly transparent about using attacks to deflect criticism, I strongly suspect that Seagrave is being sincere, which makes the quote all the more disturbing. The recent stories in the New York Times have questioned the appropriateness and effectiveness of the schools' methods. They did not in any way suggest that the students at the schools were somehow less academically or intellectually capable. On that level, Seagrave's comment would seem to be a total non sequitur. But I don't think she was making that argument. I've been on this beat for a long time now and I've seen enough similar responses to have a pretty good feel for these discussions and my take is that she was reacting to the criticism on a very general level. To make negative statements about Eva Moskowitz and the Success Academies network was to imply that poor, minority kids were beyond help. Watching the video below, it is easy to sympathize for the first minute or two, but by the last thirty seconds or so, it is troublingly clear that if you disapprove of Moskowitz's approach or even if you just feel something else is better, there is virtually no common ground. When you spend years consuming way too much news, you start becoming alert to indications that a story is about to pick up speed. For example, there have been lots of signs that the latest round of criticism Eva Moskowitz and the Success Academies is going to find more and more traction in the near future. (That's the main reason I put out a second post on Friday.) Along these lines, Diane Ravitch pointed out an interesting development yesterday. Success has switched public relations companies several times over the last year in an attempt to tamp down critical coverage of the network. On Friday, the influential PR firm Mercury announced that it would now be representing Success, a pivot from the internal communications team that has handled the network's media requests for roughly a year. Mercury is a high-stakes public strategy firm. We use our expertise and reach to gain competitive advantage for clients. Our expertise comes from extensive must-win campaign experience and operating successfully at the highest rung of business, government, politics and media around the globe. Our reach is the ability to use strategic intelligence to mobilize the message and persuade the toughest audiences. We know what it takes to win in difficult situations. We have proven results for prominent figures, leading advocacy groups, governments, political parties and the world’s most successful companies. LANSING -- Gov. Rick Snyder has hired the national public relations firm Mercury LLC, where the spouse of Snyder's new chief of staff is a senior vice president, to help with communications during the Flint water crisis. What's the point of advocating any economic policies (either using left or right wing logic) on the basis that they will boost economic growth and create jobs if as soon as the Fed thinks that there might be upward pressure on wages at some point in the distant future they're going to raise interest rates? Mostly because it makes it clear that economic feedback cycles are potentially quite complex. If the government taxing money (as an example) slows growth and thus the federal reserve doesn't have to act to slow growth then do we not end up with public good benefits and the same growth rate? 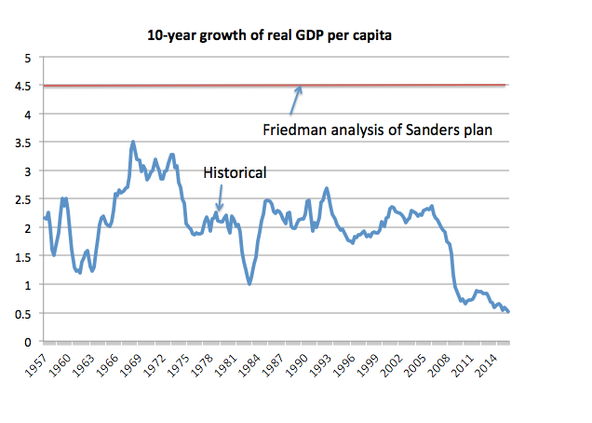 I am sure it is an oversimplification, but so is the lower taxes will always increase growth. We have not been seeing that in failed states, have we? Nor did periods of English history like the Anarchy really help England grow economically, despite the weakening of central power. Especially if central power is replaced by local power, which is often more arbitrary (ever interacted with a homeowner's association?). Finally, as Megan McArdle points out, there really isn't that much more to cut with Federal taxes except among the very high earners, unless you want to remove payroll taxes. Whether or not that would increase growth, it would have a very bad effect on current retirees. It is certainly worth pondering if we shouldn't refocus on how to make sure that the money collected is spent effectively instead of obsessing about the amount that is spent. I have been meaning to blog about this story for a long time. It raises all sorts of interesting and important questions about statistics and public policy that could merit any number of posts. Unfortunately, I haven't found bandwidth to do the topic justice. I certainly don't have time now but things are starting to heat up with the Success Academies and I need to get something down on paper, even if it is just a few quick bullet points. It is particularly worrisome when the students from an institution do particularly well on a low stakes/high-stakes test then do much worse on a high-stakes/high-stakes test. Days earlier, Moskowitz had stunned many in this town by asking the state to grant her 14 new charter schools, thus potentially catapulting her network to 46 schools. The first Success graduating class, for example, had just 32 students. When they started first grade in August 2006, those pupils were among 73 enrolled at the school. That means less than half the original group reached the eighth grade. And just 22 of Friday’s grads will be moving on to the new Success Academy High School of the Liberal Arts, which is set to open this fall, while 10 opted for other high schools. None of the 32 grads, however, will be attending any of the city’s eight elite public high schools, even though Harlem Success Academy 1 ranked in the top 1% on state math tests this year and in the top 5% in reading — a fact Moskowitz herself proudly highlighted. “We are incredibly proud of our eighth-grade graduates . . . who are proving that zip code does not have to determine destiny,” Moskowitz said in a written statement. A network spokeswoman confirmed Tuesday that 27 eighth-graders took the Specialized High Schools Admissions Test last fall, but none scored high enough to be offered a seat at one of the elite high schools that rely on the test, like Stuyvesant, Brooklyn Tech or Bronx Science. Citywide, some 26,000 eighth-graders took the specialized high schools test in the fall of 2012, and 20% were offered a seat. So you’d expect a minimum of five or six students from Success 1 to score high enough to get into one of the elite schools. Still, if Harlem Success students had matched even the 12% admission rate for black and Latino students who take the test, you’d expect at least three of the Moskowitz students to have been admitted. “We were shocked that none of our students was offered a seat in a specialized high school,” one parent told the Daily News. A quick point: while discussions of Trump's ideology can be interesting, productive, and even important, any attempts to explain his political success using ideology are largely doomed to failure. If you are asking how Trump was able to rise so quickly in defiance of conventional wisdom, you should start by looking at the flaws in that conventional wisdom. After that you should probably focus on the collapse of substantive journalism, the role of celebrity in the 21st-century, and, my personal favorite, the effects of cognitive dissonance on a Republican base that has been asked to believe a steady stream of incredible and contradictory claims for the past couple of decades. One of the things that struck me about the past two presidential elections was how completely the Nixon pivot had been taken off of the table. Both McCain and Romney dutifully followed the first step during the primaries, but whenever they tried to move back toward the center during the general election, the reaction from the base quickly sent them scurrying back to the right. Conventional wisdom saw this in terms of ideological extremism but my take-away was quite different. The GOP base has grown more conservative in the 21st century, but even taking that into account, their willingness to give their nominees any slack is much less than it was at any point in the second half of the 20th Century. My argument is that this has relatively little to do with ideology and much to do with trust. Many in the base feel (with some justification) that the social contract with the party has been violated. They are no longer willing automatically to extend credit to their party's nominees. With Trump, however, the Nixon pivot suddenly becomes not only viable but remarkably easy. He has a great personal bond with his supporters, his appeal is not particularly ideological, and he has been able to hold heterodox positions without paying a political penalty. A pivot to the center would not even require covering any new territory. Trump's "platform" has been so erratic and unpredictable that all he would have to do would be to embrace some of the positions he held then implicitly or explicitly abandoned over the past 12 months. It would seem unlikely that significant portion of his core supporters would abandon him if he changed his mind once again and decided he was for high taxes on rich people. Trump’s populism has slowly intensified. "I don't get along that well with the rich. I don't even like the rich people very much," he recently said. "It's like a weird deal." He has proposed to let the federal government negotiate lower prices for Medicare prescription drugs, a plan horrifying to conservatives (and drug companies). Like other Republicans, he proposes to eliminate Obamacare and replace it with something undefined but wonderful. The reason Trump’s vague repeal-and-replace stance makes them so nervous is that he once advocated single-payer insurance, and he has emphasized, in a way other Republicans have not, the horrors of leaving people who are too poor or sick to afford insurance on their own. Trump’s shorthand description of the travails of the uninsured before Obamacare — people “dying on the street” — alarms conventional conservatives precisely because it captures the broad reality of the suffering that justified Obamacare in the first place, and which would intensify if the law is repealed. The Republican fear is that Trump’s vague promise to replace Obamacare with something terrific is not just a hand-waving tactic to justify repealing Obamacare. Their fear is that he actually means it. Trump's populist positions may place him farther away from the Republican Party's intellectual and financial vanguard, but they draw him closer to its voters. * In case you were wondering, "Slowly I turned..." aka "Niagara Falls" was a popular vaudeville routine. Pretty much everyone tried their hand at it. I find it very difficult to believe this is a real quote, that someone not only provided Dowd with the perfect comment for her piece, but actually did it in the same voice Dowd normally writes in, complete with mannered wording (how often do you hear “evokes” in casual conversation?) and clumsy analogy. In Dowd's defense, a while back she did take a piece of a Josh Marshall post and run it without quotation marks. Maybe she was just trying to even things out. Political conventional wisdom has come in for a pounding recently, particularly with the last of the Republican establishment candidates being skewered for recently restaging outtakes from WestWorld, so we all knew Dylan Byers would spring to the defense and that it would go badly. Have people really never read Walt Whitman before? Do they not understand the concept of anaphora? Nor is it part of some poetic device that makes sense if you watch the context of the speech, which I did, and which is just Rubio cycling through his standard stump lines rather than repeating them for some kind of literary effect. And this is why Rubio visibly hesitates when he is about to say “throats” for the second time. It is the horrified panic of a candidate who realizes he has just done the one thing he desperately needs at this moment not to do. "Because you like the story"
Sometimes I use posts as digital refrigerator magnets. A blog is an excellent place to store quotes, facts and news items you might want to use one of these days. You are, of course, free to disagree. But you need to carefully explain why you disagree — what evidence do you have suggesting that these scholars’ conclusions, which are based on history and data, not just gut feelings, are wrong? I have some views of my own, of course, but I’m not a political scientist, man — I just read political scientists and take their work very seriously. What I do bring to this kind of discussion, I hope, is an awareness of two kinds of sin that can corrupt political discussion. The obvious sin involves actually selling one’s views. And that does happen, of course. But what happens even more, in my experience, is an intellectual sin whose effects can be just as bad: self-indulgence. By this I mean believing things, and advocating for policies, because you like the story rather than because you have any good evidence that it’s true. I’ve spent a lot of time over the years going after this sort of thing on the right, where things like the claim that Barney Frank somehow caused the financial crisis so often prevail in the teeth of overwhelming evidence. But it can happen on the left, too — which is why, for example, I’m still very cautious about claims that inequality is bad for growth. These tweets from David Frum brought home a couple of points I've been meaning to make for a while now. Viewed in certain ways, particularly when you're talking about large grassroots movements, the impact of social media can be tremendous, but this does not mean that a public figure personally has to be on social media to remain relevant, and those that do use it effectively realize that the old rule about different messages working better in different media is especially true with formats like Twitter. The only politician I can think of who really gets this is Donald Trump. This is, by no means, and original observation; Josh Marshall has been making it for months. Trump uses Twitter to make simple declarations, stake out positions, exchange insults, and toss out one-liners. He keeps up a steady stream of tweets and does a good job staying in the moment of the conversation. On top of this, his long history of making outrageous statements has to a large degree innoculated him from the potential consequences of an otherwise ill considered tweet. Even more importantly, Trump does not try to force messages into the medium that don't fit. His tweets don't require context nor do you have to read multiple tweets in proper sequence. They lose nothing in the re-tweeting. Which brings us to David Frum's analysis of last Saturday's GOP debate.As Josh Marshall pointed out, it's a remarkably astute piece of work, concise and insightful. It would make an excellent blog post, but you can't just chop up a post into a bunch of tweets. Even with a very good post (perhaps particularly not with a very good one). These points need to be read uninterrupted and in order. All three lose a great deal out of context. I understand why Frum would want to be on Twitter, but his message does not fit the medium, and that seldom works out well. Finding exaggerated value either artistic, intellectual, or historic in something because you feel the thrill of recognition or because it confirms a theory or because it makes for a nice narrative. There is obviously a great deal of overlap here and I thought about rolling them up into one category, but there are some important distinctions.In most journalistic genres, the narrative variety has hit epidemic levels. In coverage of popular media, however, where fanboy critics exert extraordinary influence, recognition kalopsia is dominant (just drop by the Onion's AV Club sometime for the genre in its refined form). Scott Lemieux got me thinking about this with a post on LGM which in turn directed me to this excellent essay by Pauline Kael (“Circles and Squares”) which probably made her even more enemies than “Raising Kane” a few years later. Some of the loudest voices in the Kane backlash were those she had demolished in the earlier piece. "... the second premise of the auteur theory is the distinguishable personality of the director as a criterion of value." Up to this point there has really been no theory, and now, when Sarris begins to work on his foundation, the entire edifice of civilized standards of taste collapses while he's tacking down his floorboards. Traditionally, in any art, the personalities of all those involved in a production have been a factor in judgment, but that the distinguishability of personality should in itself be a criterion of value completely confuses normal judgment. The smell of a skunk is more distinguishable than the perfume of a rose; does that make it better? Hitchcock's personality is certainly more distinguishable in Dial M for Murder, Rear Window, Vertigo, than Carol Reed's in The Stars Look Down, Odd Man Out, The Fallen Idol, The Third Man, An Outcast of the Islands, if for no other reason than because Hitchcock repeats while Reed tackles new subject matter. But how does this distinguishable personality function as a criterion for judging the works? We recognize the hands of Carne and Prevert in Le Jour se Leve, but that is not what makes it a beautiful film; we can just as easily recognize their hands in Quai des Brumes—which is not such a good film. We can recognize that Le Plaisir and The Earrings of Madame De are both the work of Ophuls, but Le Plaisir is not a great film, and Madame De is. Often the works in which we are most aware of the personality of the director are his worst films—when he falls back on the devices he has already done to death. When a famous director makes a good movie, we look at the movie, we don't think about the director's personality; when he makes a stinker we notice his familiar touches because there's not much else to watch. When Preminger makes an expert, entertaining whodunit like Laura, we don't look for his personality (it has become part of the texture of the film); when he makes an atrocity like Whirlpool, there's plenty of time to look for his "personality" — if that's your idea of a good time. It could even be argued, I think, that Hitchcock's uniformity, his mastery of tricks, and his cleverness at getting audiences to respond according to his calculations — the feedback he wants and gets from them — reveal not so much a personal style as a personal theory of audience psychology, that his methods and approach are not those of an artist but a prestidigitator. The auteur critics respond just as Hitchcock expects the gullible to respond. This is not so surprising — often the works auteur critics call masterpieces are ones that seem to reveal the contempt of the director for the audience. An IBM survey found that worldwide, urban drivers spend an average of 20 minutes per trip looking for parking. Is it really such a bad idea to universally charge for parking in public places such that the resource does not become wildly over-used? 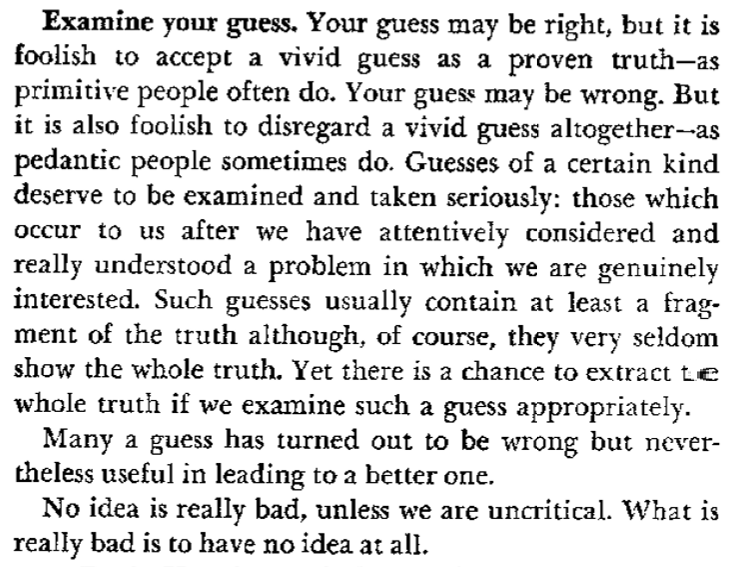 This passage from Polya's How to Solve It makes a nice companion to the earlier quote from Dwight Eisenhower on planning. I do, however, have one criterion that I think Polya needed to add. 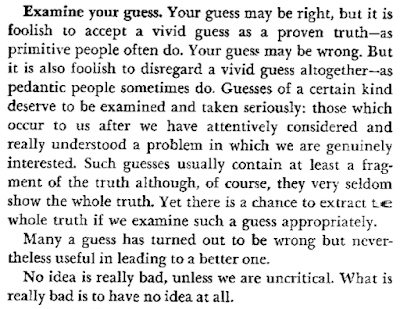 In addition to attentiveness, understanding and interest, to get guesses of real value, the guesser needs independence. If your thinking simply follows the tracks laid down by other, you're probably wasting everyone's time. Bob Elliot, partner with Ray Goulding in the team Bob and Ray, father of Chris and grandfather of Abby died Tuesday at the age of 92. You could make a case for Bob and Ray being the most influential comedy act of their time and the one that has held up the best, but it can be extraordinarily difficult explaining just what was and is so funny about them. In an era when the familiar sobriquet "man of a thousand voices" was often not much of an exaggeration, they had maybe a half-dozen voices between them. The other shows of the time, whether they were comedies like the Goon Show or the latest from Stan Freberg, dramas like Gunsmoke or anthologies like CBS Radio Workshop featured large, versatile casts, elaborate production and beautifully edited sound montages. With masterly comic timing — Mr. Elliott with a nasal deadpan, Goulding with booming authority — Bob and Ray mocked the cliches and banalities of newscasts, politics, sports and advertising. The characters they played were inept, pompous or shady — logic-free “experts,” sore political losers, dense reporters and dimwitted everymen. One of their favorite skits involved Wally Ballou interviewing a paperclip company tycoon who tackles “waste and inefficiency” by running a sweatshop of indentured servants. Employees, who earn 14 cents a week, are bound by a “99-year sweetheart contract” and imprisoned if they try to quit. “How can anybody possibly live on 14 cents a week?” Ballou asks. Their playfully warped sensibilities often involved sly commentaries of the conventions of radio and TV, and the people who take those mediums seriously. Bob and Ray’s admirers extended far beyond show business figures such as Allen and Letterman. One of their most devoted fans was novelist Kurt Vonnegut Jr., who once wrote in a foreword to the 1975 collection “Write If You Get Work: The Best of Bob & Ray”: “They feature Americans who are almost always fourth-rate or below, engaged in enterprises which, if not contemptible, are at least insane. I generally try to cut back on my political news consumption during and immediately after the Iowa caucuses. Though the event does bring some new information to the table, it also inevitably brings a great deal more noise. I did decide to bend my rules a bit for these two Krugman posts and was well rewarded for my time. In particular, I thought his discussion of Iowa as a Schelling focal point was as insightful as any piece of political analysis I've seen in 2016. Consider a simple example: two people unable to communicate with each other are each shown a panel of four squares and asked to select one; if and only if they both select the same one, they will each receive a prize. Three of the squares are blue and one is red. Assuming they each know nothing about the other player, but that they each do want to win the prize, then they will, reasonably, both choose the red square. Of course, the red square is not in a sense a better square; they could win by both choosing any square. And it is only the "right" square to select if a player can be sure that the other player has selected it; but by hypothesis neither can. However, it is the most salient and notable square, so—lacking any other one—most people will choose it, and this will in fact (often) work. How does this apply to news coverage and punditry? Well, it’s obvious that the media have strong herding instincts; almost everyone wants to be somewhere close to the middle of the pack, telling the prevailing narrative. But there are many narratives that could, in fact, prevail. Partly that’s because such narratives can be self-fulfilling, and partly it’s because actually being, you know, right isn’t that important compared with being on top of the trend. So anything that gives special salience to a particular narrative can produce convergence on that narrative, even if everyone realizes that what’s going on is basically stupid. Thus, should Rubio’s third-place finish in a small state really have caused him to shoot up so dramatically in market estimates of his probability of winning the GOP nomination? No, yet that’s what happened. Meanwhile, on the Democratic side, the results were in all important respects a tie — but Clinton was a whisker ahead. Did that whisker matter? I’m pretty sure it did, a lot. If Sanders had come in even slightly ahead, the news would have been full of Clinton-is-doomed reports. Instead, the coverage has, as best I can tell, been rather subdued. Everyone knows that a fraction of a point in the vote makes no objective difference; but everyone also knows that “Iowa almost tied!” isn’t the same kind of focal point for Clinton doom stories as “Clinton defeated!” And so the coverage is radically different — and the betting markets have treated Iowa on the Democratic side as a non-event. On a related note, there's an observation I've shared recently with friends and I've been meaning to work into a post. Back when Krugman first got serious about being a pundit, he was remarkably strong in two areas: economics (unsurprisingly) and press criticism ("Shape of Earth—Views Differ" alone would earn him the honor), but rather weak when it came to politics. This was particularly notable around 2008 and 2009. But Krugman did a couple of remarkable things (at least remarkable for an NYT columnist): he admitted his mistakes and he learned from them. His political analyses have improved steadily while the quality and credibility of most political commentators have fallen down a mine shaft. One of the points that Joseph and I have been hammering away at for years now is that, as proposed, most of the proposed incentive and metric-based models of the education reform movement are dangerously vulnerable to gaming, data cooking, and out-and-out fraud. Back in 2010, this position was very much on the fringe. Today, not so much. Former ODE school choice director David Hansen, the man in charge of charter school oversight, engaged in a fraudulent scheme to boost the evaluations of some charters. Mr. Hansen, whose wife worked as the governor’s chief of staff until she left to manage his presidential campaign, admitted scrubbing data on failing online and dropout recovery-charters to improve their standing in the state. Some outraged state school board members charged Mr. Hansen with breaking the law and demanded an impartial investigation. Team Kasich quashed that notion and contained the political damage. Then-state superintendent Richard Ross professed no prior knowledge of the fraud perpetrated on his watch by his subordinate to promote an administration mandate. Unexplained is why Mr. Ross forwarded Mr. Hansen’s falsified data to the U.S. Department of Education for funding, despite the controversy over his cooked books. ODE’s discredited charter czar quietly resigned from the department, followed by the retirement of the superintendent months later. The department that had allowed the data scam to proceed in a calculated move for public dollars — without regard for educational accountability — vowed to enact internal reforms. No need for outside scrutiny. Chagrined state lawmakers who were previously in no hurry to pass charter school reform, finally approved legislation to take the heat off Mr. Kasich. The changes will only be meaningful if they are implemented by the Kasich people running the ODE. Public education advocates aren’t holding their breath for wholesale reform of the charter school industry in Ohio, which is fine with the Kasich administration. It pushed a potential political liability off the radar to let Mr. Kasich spin on the campaign trail without distraction. A while back, I collected all of those 2010 education reform post in a Kindle single called Things I Saw at the Counter-Reformation. If you would like to see how the arguments hold up, check it out. You probably all remember the issues the New York Times had with bad information from anonymous sources on the Hillary Clinton email story and the social media accounts of the San Bernardino shooters. More recently, our blog had a long post questioning the ethics of a New York Times Magazine piece that allowed a controversial scholar to present her side of an academic dispute in the most favorable conditions imaginable. New York Times editor Dean Baquet told Margaret Sullivan, the paper's public editor, on Monday that he "would have walked away from the interview." The newspaper's standards editor, Philip B. Corbett, said the paper does not grant "prepublication approval to anyone." Pretty much anytime you point out an issue with the New York Times' ethics or quality control, this will be the other half of the problem: The paper really does see itself as a gold standard, not perfect perhaps, but far better than any of its peers. This attitude effectively prevents any serious self examination let alone real attempts at reform. Would have New York Times have published the Sean Penn piece? I have no idea. Have they recently published articles that gave sources an inappropriate level of influence and thus misinformed their readers? Unquestionably. What's worse, the Rolling Stone piece came with a disclaimer. The New York Times simply leaves it to us to it figure out on our own.